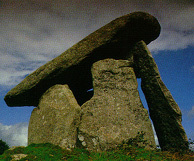 !Well Within's Earth Mysteries & Sacred Site Tours to Mystical Cornwall (includes Stonehenge)! Other dates possible too - private tours also possible for 2 or more people. Beautiful Cornwall is in the extreme southwestern part of Britain. Cornwall is a peninsula encircled by coastline that abounds with rugged cliffs, hidden bays, fishing villages, sandy beaches & sheltered coves where pirates & smuggling were once common. The Cornish people have a Celtic-Iberian origin which still lives on in superstition, folklore & fairy tales. Come journey with us to mystical Cornwall - land of the Celts, Arthur, Goddesses, standing stones, earth mysteries, leylines, and mystery! A trip of a lifetime!! Bookstore - Celtic, Arthurian, History's Mysteries, Fiction, Goddess, Homeopathy & more. Cost: Starting at ONLY $2095 USD + airfare Call for details.